About a month ago (perhaps more) I reached the point where I decided that enough was enough. My craft space had become unworkable for me. I was trying in vain to work and to craft from one space and it was proving to be very difficult, if not impossible to do anything efficiently. And, frankly, I did not like my room layout anymore. I love the fact that everything I need to craft is within easy reach. The slat wall provides loads of space to store tools and it's nice that I can make it look quite decorative too. I also have a chrome Under Shelf Storage Basket which holds all my cutting pads and magnetic plates and accessories for my Big Shot, Gemini and Scan n Cut. I got bitten by the DIY bug and made myself a rather crude but really useful rotating ink storage unit. The Ink Pad storage units from LaserSmiths have been placed on a wooden Lazy Susan (bought from Ebay) and I added a wooden box to the top to hold all my acrylic blocks, heat tool and a lot of my cutting dies. 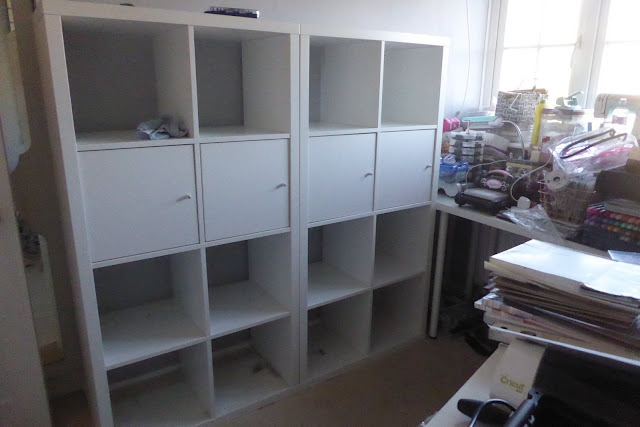 I don't have much floor space at all, so I stacked my two sets of Alex Drawers from Ikea and added a small Pahl shelving unit on top to hold my punches and display cards, etc. 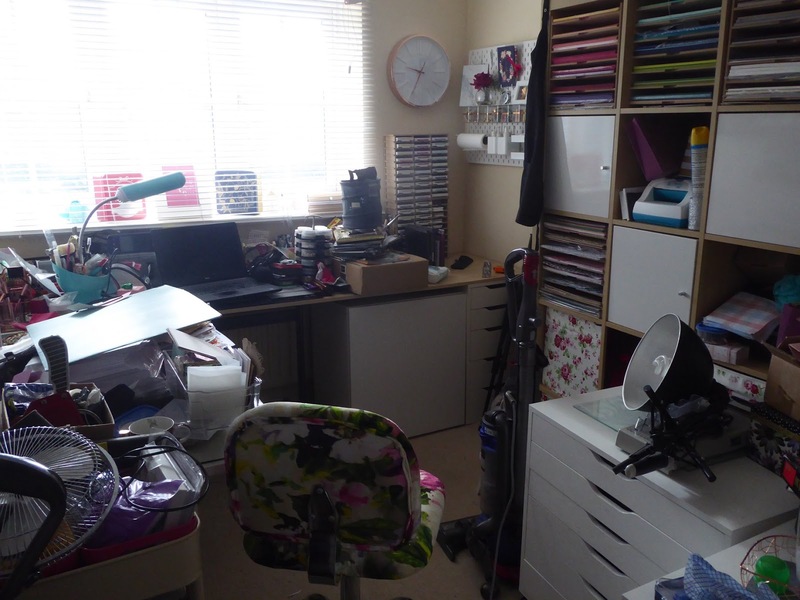 To anyone who has been thinking of re-organising their craft/work space, I would urge you to do so. Its a really cathartic exercise and you will feel so much more inspired to get down to some serious crafting. I definitely recommend having a dedicated desk for admin work and a separate one for creating and getting messy !! I meant to add that I painted my walls in Chic Shadow by Dulux. It does go on very dark but dries to a lovely shade of grey. Hope you like what I have done. Thank you for looking and happy crafting ! Lovely room Linda! My room is much bigger :/ But it´s so easy to get just to much stuff...I´m looking forward to see more of your georgeous cards and other crafts that you create. MS. Linda, Wow what a wonderful space. I plan on redoing my room. It is not user friendly anymore. Toooooooooooooo!!!!! Much stuff (LOL) I have started working on the dining room table. My family hate me moving into there space. I plan to start reorganizing either in May or June. (I hope) I will send you a before and after picture when I get brave enough to start. I said all of this because you have Inspire me to take action. But, how do I get started? Do I get brave and take a lot out at one time, or a little at a time? I am afraid I might put everything back and have 2 messy rooms. Suggestions please!! Lovely and I appreciated you doing it as I benefited for your paper.